and Michael McCann, Ph.D., C.I.H. The following article will introduce both hazards and safety precautions recommended for intaglio. Intaglio is a printmaking process in which ink is pressed into depressed areas of the plate and then transferred to paper. These depressed areas can be produced by a variety of techniques, including acid etching, drypoint, engraving, and mezzotint. This article is an excerpt from our new data sheet: Lithography, Intaglio, and Relief Printing. Intaglio inks consist of pigments suspended in linseed oil as a vehicle. There can be additional hazardous binders or preservatives. 1. Oil-based inks contain treated linseed oils. While linseed oil is not considered a hazard by skin contact or inhalation, ingestion of large amounts of some treated linseed oils might be hazardous due to presence of small amounts of toxic heavy metals. Oil vehicles are flammable when heated, and rags soaked in these may ignite by spontaneous combustion. 1. Know what materials are used. Obtain the material safety data sheets (MSDSs) on all products used. 2. Use the least toxic inks possible. 3. Children under the age of 12 should not do intaglio because of the need for solvents. 4. Do not use an open flame to heat linseed oil, linseed oil varnishes, or burnt plate oil. Take normal fire prevention measures by not smoking or using open flames in the work area. Place oil-soaked rags in self-closing disposal cans and remove them from the studio each day. An alternative is to place the oil-soaked rags in a pail of water. Pigments are the colorants used in intaglio printing inks. There are two types of pigments: inorganic pigments and organic pigments. 1. Pigment poisoning can occur if pigments are inhaled or ingested. For normal printing with prepared inks, the main hazard is accidental ingestion of pigments due to eating, drinking, or smoking while working, or inadvertent hand-to-mouth contact. 3. Some of the inorganic pigments, in particular cadmium pigments, chrome yellow, and zinc yellow (zinc chromate) may cause lung cancer if inhaled. In addition, lamp black and carbon black may contain impurities that can cause skin cancer. 4. Chromate pigments (chrome yellow and zinc yellow) may cause skin ulceration and allergic skin reactions. 1. Obtain MSDSs on all pigments. This is especially important because the name that appears on label of the color may or may not truly represent the pigments present. 2. Use the safest pigments possible. Avoid lead pigments whenever possible. 3. Children under the age of 12 shouldn't use toxic pigments. 4. Avoid mixing dry pigments whenever possible. Never mix your own chrome yellow, zinc yellow, chrome green, molybdate orange, or any other pigments that are known human carcinogens. If possible, do not mix highly toxic pigments such as lead white or cadmium colors. 5. If dry pigments are mixed, do it inside a glove box (a box with a glass or plexiglas top and holes in the sides for arms or inside a laboratory-type fume hood. 6. If a glove box or exhaust hood is not practical, wear a NIOSH- approved toxic dust respirator when mixing dry pigments. In general, organic solvents are one of the most underrated hazards in art materials. Organic solvents are used in printmaking to dissolve and mix with oils, resins, varnishes, and inks; and to clean plates, rollers, tools, silk screens, and even hands. 1. Repeated or prolonged skin contact with solvents can cause defatting of the skin and resultant dermatitis (rashes, drying and cracking of skin, itching, etc.). Many solvents, for example turpentine, methyl alcohol, toluene, and xylene, can also be harmful through skin absorption. 2. Inhalation of solvent vapors is the major way in which solvents are harmful. High concentrations of most solvents can cause narcosis (dizziness, nausea, fatigue, loss of coordination, coma, etc.). This can also increase the chances for mistakes and accidents. Research during the last 10 years has indicated that chronic occupational exposure to many solvents can cause permanent brain damage, with symptoms including loss of memory, behavioral changes, fatigue, spasticity, decreased intelligence, slower reflexes, poor hand-eye coordination, etc. Most of these studies are on mixed solvents so it is difficult to implicate particular solvents. There is at least one documented case of such brain damage affecting a silk screen artist. Solvents can also attack other organ systems besides the nervous system. In particular, turpentine can damage the kidneys, toluene and chlorinated hydrocarbons can affect the liver, and methylene chloride can affect the heart. 3. Many solvents are toxic if ingested. This is particularly a problem with young children swallowing solvents that have been placed in glasses or other food or drink containers, although this has also happened with adults. Swallowing 1/5 ounce of turpentine can be fatal to a 5-year old child. 4. Most solvents, except chlorinated hydrocarbons, are also either flammable or combustible. A solvent is flammable if its vapors can burn below 100°F when a source of ignition is present; if the temperature has to be over 100°F before it will burn, the solvent is combustible. For example, ethyl alcohol and toluene are flammable, and kerosene and mineral spirits (Varsol or paint thinner) are combustible. 1. Obtain the MSDS on all solvent products used. Use the least toxic solvent possible. For example, replace the more toxic methyl alcohol (methyl hydrate) with denatured alcohol or isopropyl alcohol. 2. Do not use solvents with or around children under 12 years, or if you are pregnant or nursing. 3. Use dilution ventilation (e.g. window exhaust fan) for exhausting less than a cup of evaporated solvent per day. Otherwise use local exhaust ventilation such as a slot hood, or set up the window exhaust fan 1-2 feet away. 4. Keep minimum amounts of solvents on hand and purchase in the smallest practical container size. Large amounts of solvents or solvent-containing materials should be stored in a flammable storage cabinet. 5. Never store solvents or solvent-containing materials in food or drink containers. Always label containers. 6. Do not allow smoking, open flames, or other sources of ignition near solvents. 7. Have a class B fire extinguisher in the area. (If ordinary combustible materials are present, you may need a Class ABC fire extinguisher). 8. Wear gloves when handling solvents to avoid skin contact. Do not use solvents to clean ink off hands. Baby oil is a good substitute. 9. If ventilation is not adequate, wear NIOSH-approved respirators with organic vapor cartridges. 10. Do not induce vomiting if petroleum distillates are swallowed. Give 1-2 glasses of water or milk and contact a regional Poison Control Center. Acids are used in acid etching in intaglio. Strong acids commonly used include nitric acid and hydrochloric acid. 1. Concentrated acids are corrosive to the skin, eyes, respiratory system, and gastrointestinal system. Dilute acids can cause skin irritation on repeated or prolonged contact. 2. Concentrated nitric acid is a strong oxidizing agent and can react explosively with other concentrated acids, solvents, etc. Nitric acid gives off various nitrogen oxide gases, including nitrogen dioxide, a strong lung irritant that can cause emphysema. 1. Know what is used. Obtain the MSDS for all acids. 2. Avoid concentrated acids whenever possible. 3. Children under the age of 12 should not use or be around acids. 4. Acid etching requires local exhaust ventilation such as an enclosed or slot hood; or set up the window exhaust fan at work level 1-2 feet away. 5. Store concentrated acids away from organic materials. Concentrated nitric acid should always be stored separately even from other acids. 6. An important safety rule when diluting concentrated acids is to add the acid to the water, never the reverse. 7. Wear appropriate gloves, goggles, and protective apron or lab coat when handling acids. 8. If adequate ventilation is not available, wear a NIOSH-approved respirator with acid gas cartridges. Do not use air-purifying respirators with nitric acid because the nitrogen dioxide cannot be detected by odor, and therefore it is not possible to detect odor with charcoal cartridges. 9. An emergency shower and eyewash fountain that is not hand-held should be in studios where concentrated acids are mixed or used. Portable eyewash bottles are not recommended. If acid is spilled on your skin, wash with lots of water. In case of eye contact, rinse the eyes with water for at least 15-20 minutes and contact a physician. 10. Do not induce vomiting if concentrated acids are swallowed. Give 1-2 glasses of water or milk and contact a regional Poison Control Center. 11. Used acid solutions should be disposed of by neutralizing them with sodium bicarbonate (baking soda) before pouring them down the sink with lots of water. etch the copper or zinc metal plate. Unetched parts of the plate are protected with resists such as stopout varnishes containing ethyl alcohol, grounds containing asphaltum or gilsonite, and mineral spirits, rubber cement, and rosin or spray paints for aquatinting. Sometimes, soft grounds contain more toxic solvents. trichloroethane found in some soft grounds is moderately toxic by inhalation under normal conditions, but may cause fatalities at very high concentrations. 2. See the Acids section for the hazards of acids. In particular, nitric acid etching releases the respiratory irritant nitrogen dioxide which has poor odor warning properties. Large acute overexposures may cause pulmonary edema (chemical pneumonia), and chronic exposure may cause emphysema. During the etching process, flammable hydrogen gas is also produced. 3. Concentrated nitric acid is a strong oxidizing agent and can react with many other chemicals, especially solvents or other organic compounds, to cause a fire. 4. Mixing hydrochloric acid with potassium chlorate to make Dutch mordant produces highly toxic chlorine gas. Several years ago, five art students and teachers had chlorine poisoning in Canada from mixing Dutch mordant without proper ventilation. Potassium chlorate is a key ingredient in many explosives, and is a potent oxidizing agent. It can react explosively with organic compounds, sulfur compounds, sulfuric acid, or even dirt or clothing. When heated, it can violently decompose to oxygen and potassium chloride. Storage and use are very dangerous and require special precautions, especially when mixing. 5. Rosin dust (and asphaltum dust which is also sometimes used) is combustible. Sparks or static electricity have caused explosions in enclosed rosin and aquatint boxes. Rosin dust may also cause asthma and allergic dermatitis in some individuals. 6. Inhalation of solvents and pigments can result from use of aerosol spray paints. 1. Obtain the MSDS for all materials used. 2. See the Solvents and Acids sections for specific precautions. 3. Secondary schools should not use Dutch mordant. Artists, colleges, and universities should use it with extreme caution. A safer substitute for etching copper plates is ferric chloride (iron perchloride). This forms acidic solutions so should be handled accordingly, but does not have the dangers of handling concentrated acids. Ferric chloride solution might cause minor skin irritation from prolonged contact. 4. Application of grounds or stopouts should be done with local exhaust ventilation, (e.g. slot or enclosed hood), or with a window exhaust fan located 1-2 feet away. 5. Application of spray paints should be done inside a spray booth that exhausts to the outside, or outdoors. 6. Acid etching should be done with local exhaust ventilation. See the section on precautions for acids for more information. Note that the acid gases will eventually corrode ordinary fans or galvanized ducts. 7. Rosin (or asphaltum) boxes should be explosion-proof. Use sparkproof metal cranks, explosion-proof motors, or compressed air. Don't use hair dryers to stir up rosin dust. Drypoint, mezzotint, and engraving use sharp tools to incise lines in metal plates. 1. Accidents from using sharp tools is one major hazard associated with these types of processes. 2. Long-term use of these tools can cause carpel tunnel syndrome, which can cause numbness and pain in the first three fingers. Severe cases can be incapacitating. 1. Keep tools sharp, store them safely, and always cut away from yourself. 2. When possible, clamp down plates to avoid slippage. 3. Minimize the chance of carpel tunnel syndrome by choosing tools with wide handles, avoiding tight grips, and doing hand flexing exercises during regular rest periods. Set work table height so wrist flexing motions are minimal. Intaglio inks contain pigments, treated linseed oil, and modifiers. 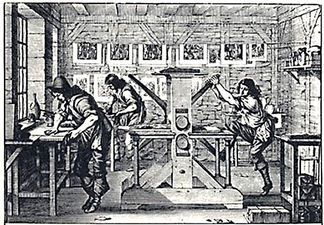 Printing involves placing the ink on the inking slab, inking the plate by hand, and then printing. Cleanup of the inking slab, press bed, and cleaning the plate is done with a variety of solvents including mineral spirits, alcohol, lithotine, turpentine, etc. 1. Preparing your own inks from dry pigments can involve inhalation of toxic pigments. See the Pigments section for the hazards of pigments. 2. See the Solvents section for the hazards of solvents. Plate cleaning is more hazardous than cleaning inking slabs or press beds because larger amounts of solvents are used. 3. Lithotine, turpentine, or oil-soaked rags can be a spontaneous combustion hazard if improperly stored. 1. See the Pigments and Solvents sections for the specific precautions for pigments and solvents. 2. Dilution ventilation (e.g. window exhaust fan) is sufficient for cleaning press beds and inking slabs if small amounts of solvents are used. 3. Local exhaust ventilation, as provided by a slot hood, or a window exhaust fan 1-2 feet away should be used for cleaning resists off etching plates. 4. Oil-soaked rags should be stored in approved oily waste cans that are emptied each day. An alternative is to store them in a pail of water and then allow them to dry out for reuse, or dispose of the wet rags by placing in a plastic bag. 5. NIOSH-approved respirators with organic vapor cartridges can be used if ventilation is not adequate. Photoprintmaking involves exposing a light-sensitive emulsion or film to ultraviolet light through a transparent support containing an opaque image to transfer the image to a plate. The transparency through which the photoemulsions are developed can include drawings on a transparent support such as Mylar or acetate, or photographic images processed on graphic arts film to yield a positive image. Photoetching is discussed here, while the data sheet Lithography, Intaglio, and Relief Printing addresses several other photoprintmaking methods. Photoetching is usually done using the KPR products. Photoresist dyes often contain a variety of highly toxic solvents, including ethylene glycol monomethyl ether acetate (2-ethoxyethyl acetate, cellosolve acetate), ethylene glycol monoethyl ether, and xylene, and benzaldehyde. The developers contain xylene and ethylene glycol monomethyl ether acetate (2-methoxyethyl acetate or methyl cellosolve acetate). Developers used for safer presensitized plates also contain solvents. Exposure of the plate is done with ultraviolet sources such as carbon arcs, mercury lamps, or metal halide lamps. 1. See the Solvents section for the hazards of various solvents. In particular, methyl and ethyl ether acetates of ethylene glycol are highly toxic by skin absorption and inhalation and can cause anemia, kidney damage, testicular atrophy and sterility in men, and miscarriages and birth defects in pregnant women. 2. Xylene is moderately toxic by skin absorption, and highly toxic by inhalation and ingestion. It is a strong narcotic. 3. The Photolithography section discusses carbon arc hazards. 1. See the Solvents section for precautions with solvents. 2. Pregnant or nursing women, children, and men trying to conceive should not work with these materials. 3. Use photofloods or other light sources instead of carbon arcs. Precautions with carbon arcs is discussed in the Photolithography section. 4. Use presensitized plates if possible. 5. Use photoresist solutions with local exhaust ventilation, or wear an organic vapor respirator. Wear butyl rubber gloves when handling KPR solutions. High contrast graphic arts films such as Kodalith are used to produce photographic images for photoprintmaking. There are various hazards of darkroom chemistry. These, and recommended safety precautions, are discussed in other CSA publications on photographic processes.